Dedicated reader(s) of this blog, of which there are few, may know that I previously wrote a rambling post considering the merits of e-readers versus books, taking into account the merits of the new and old mediums. Looking back on that article, I made a pretty good case that e-readers had a long way to go to replace the ever resilient book, in many respects unchanged since Gutenberg‘s day. Yet, the allure of the new still kept tempting me. I started saving my nickels and dimes,a self-imposed exercise in delayed gratification with the thought that it would take me a long time to save up to buy a Kindle. 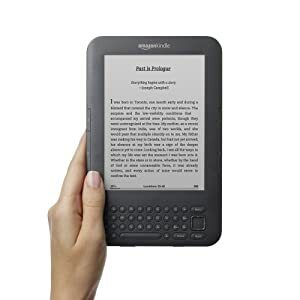 I was hoping the price would come down on e-readers, and that the Nook, Kindle, and other e-readers would improve, making my decision on which one to buy easier. Well, my lovely wife made my decision a lot easier. Last year, she gave me a brand spankin’ new Kindle for Christmas, the 3G version. That’s right, don’t you wish you had married her? The day after Christmas, with the Kindle charged up and ready, I began a new reading adventure. My first real world “road test” of the Kindle was actually a road test. The day after Christmas, we traveled to North Carolina’s Outer Banks for a week-long getaway with friends. I downloaded a book at home and started reading it in the car on the way to the beach. Even with bright sunlight on the e-ink screen, the Kindle was very easy to read, something that can’t easily be done with the iPad. I hesitate to compare the Kindle to the iPad, since the two devices are really very different, but one of the most popular uses of the iPad is as an e-reader, so the comparison is pertinent. For a reading device, the new Kindle is hard to beat. The weight and overall size are comparable to a paperback book, and the size of the reading screen is about as large as the reading area of a paperback. I work with a lot of people who travel often, and weight of this device will appeal to book loving travelers. Comparing the new Kindle with a friend’s first generation Kindle, the screen text is clearer, with very good screen contrast. With clear text available from small to jumbo sizes, this middle-aged, bifocal-wearing reader quickly found a suitably sized text that made the Kindle very easy on my old eyes. The 3G Whispernet service is very fast, making book downloads a breeze, once you’ve found the book using the rudimentary keyboard to search for a title or author. (Oh, wait, this is the good part of my review…more on that keyboard later.) Also, the battery life is phenomenal. I spent the week reading the Kindle at the beach without a fresh charge. You can recharge via USB, or from a standard wall socket with an included adapter. One very handy feature of the Kindle is the included reference dictionary, making it a breeze to look up the meaning of an unfamiliar word. I normally keep a copy of Webster’s Collegiate Dictionary on my bedside table for this purpose, but the Kindle’s look-up feature is hands-down easier to use and, if not comprehensive, perfectly adequate for English language words. The Kindle 3G costs most of two c-notes, which is expensive enough that I expected Amazon to include a case. On my way to the beach, I stopped at Target – a brick-and-mortar Kindle retailer – and purchased a cheap case. I realize Amazon wants to sell high-priced faux leather cases, but for the price of the unit, they should include at least a cheap vinyl case, something to give a limited measure of protection to the Kindle device. I read a lot of non-fiction, and pictures help establish context and bring the text to life. While the e-ink screen is very readable for text, images are poorly rendered, even with the improved gray-scale resolution in the new Kindle. The new generation of Kindle does a better job with pictures than earlier models, but lets just say these pictures are quite worth a thousand words. Without color, you can forget about beautiful color illustrations. But, the image quality is good enough for decorative graphics, as evidenced by the screen saver pictures of notable authors. For some reason, Amazon missed the mark by not using the Kindle’s limited graphic capabilities to dress up the menu system, a boring black and white listing of text. Now, about that keyboard. It is very small, but unlike Blackberries or other smart phones, the keyboard is not easily “thumbable.” Also, there are no numbers on the keyboard, you find numbers with the Sym key menu. This isn’t much of a problem in theory, but it is inconvenient because of the way e-books handle pagination, using locations. According to Amazon’s Kindle User Guide, “Locations are the digital answer to page numbers.” What this means in practice is that if you are looking to return to a particular place in a book, and you haven’t electronically highlighted the text you want to return to, you need to know the location number. If you know this magic number, you have to press the Sym key, then navigate around using the 5-way controller to click around and enter numbers. It is tedious to do this with a 5-way controller, and would be much simpler if the keyboard had number buttons, or even a shift function to turn the some of the letter keys into number keys. The concept of locations is very unintuitive. For example, a book with 300 or so printed pages has about 7,000 locations. Nowhere can I find a good explanation of what the length of a location is, although I found one blogger who has considered the topic in some detail. I’m sure in time I’ll get some intuition about a book’s length based on the number of location units instead of pages, but it is a little disconcerting. Thankfully, the Kindle does display a more useful number, the percentage of locations that you have read. We think about percentages with reading when we say things like “I read half the book and just got tired of it!” The bad thing is that you can’t got to a particular place by the more natural, intuitive percentage, only by location number. You can’t go to the 50% mark in a book, for instance, since the navigation only works with these mysterious location numbers. I’ve only purchased a couple of e-books so far, but what I’ve already seen is that not all e-books are the same. One book had each chapter marked for easy navigation, while the another only had the cover and first page marked – you had to use those strange locations numbers to jump around the book. With a four-year old daughter, I find that I am often distracted while reading, jumping back and forth to refresh my memory on a name or date that I read in previous chapter. Having the chapter marks really made this easy, but there is, so far as I can tell, no way to know the whether an e-book is thoughtfully structured in this way before buying the e-book. Amazon has missed the boat on creating an open, usable platform. Interested in selling books through their store, they’ve made it near impossible to use any other kind of DRM e-book, even from a library. This is a huge disservice to their customers, all in the name of profits. They’ve also made it impossible to share a book, even for a limited time, with another Kindle user, something you can do with Barnes & Noble’s Nook e-reader. I would bet that a reasonable book sharing function would increase book sales in the long run for Amazon. Amazon advertises that they have over 700,000 books available for the Kindle, but I’ve been shocked to find that many catalog books aren’t available. After reading Sarah Vowell‘s newer books last year, I wanted to read one of her earlier books, Take the Cannoli, but it wasn’t available as a Kindle book. This is a book from a popular author, and a relatively new book published in 2001, not deep catalog. The ugliest thing about the Kindle is the pricing of e-books. For a while, Amazon was pricing most electronic editions of books at a flat $9.99, which honestly seems expensive given that Amazon is paying a pittance to send some bits and bytes to you over the ether. On top of that, Amazon’s $9.99 flat rate is gone, and, at least from the small sampling of books I’ve looked at, is hard to find. What’s worse, when I looked for that Sarah Vowell book, I was completely shocked to find that the Kindle editions of her newer books were inexcusably more expensive than the paperback versions. I found this so shocking that I assumed readers wouldn’t believe it, and, given that prices can change, I took a screen capture of the web page, seen below. It is completely preposterous to charge more for an electronic book than a printed book. There is no reason to do it, except greed, whether on Amazon’s part or the publisher’s part. Keep in mind that the net price of a real book is even cheaper, given that you can sell the book if you want, something they’ve determinedly prevented with Kindle e-editions. As I write this, I’m looking at my Kindle, searching for Assassination Vacation, and the Kindle store reports the $11.99 price, saying “You save $3.01” and “This price was set by the publisher.” But nowhere do you see that you could save even more by going online and buying the book, and having it shipped to your house, with the possibility of sharing it with your book-loving friends or selling it at a used book store. You can browse the Amazon web site on the Kindle to discover these price discrepancies, but the browsing experience is generously described as poor. From my perspective this is a fraud and a scam, and if there is ever a situation that suggests the phrase caveat emptor, this is it. After reading this, if you were undecided before about buying a Kindle, I don’t know if I’ve helped you. I remain pleased and grateful that my wife gave me a Kindle for Christmas, and it is a very comfortable reading experience. But I wouldn’t tell everyone to rush out and get one. If you are a book loving traveler that despairs about lugging around heavy books, the Kindle might be just the thing for you. To be fair, while the Nook is a somewhat more open, and there is a color option, it has its own limitations, and in general there is a lot of room for innovation to make a truly great e-reader. This entry was posted in Books & Reading and tagged Amazon Kindle, kindle, postaweek2011. Bookmark the permalink. Thanks for this review. I was intending to buy a Kindle, if for nothing more than the clarity of text in- and outside. I was unaware of the other problems, or the outrageous cost of books. Being a writer, and bound, eventually, to sell my work electronically, I can appreciate making 60 or 70% of the sale price, but a price that high will reduce the number of sales as you point out. I got a kindle from my husband for Christmas. I absolutely love it! We live in a very remote area where it is hard to get to a bookstore and everything has to be shipped. I enjoy the convenience of being able to order a book and have it there in less than five minutes! I suppose the kindle is not for everyone, but I am definitely a fan. I do understand your comments and concerns though particularly about the page numbers. I like to know how many pages a book has in it. Knowing that information makes me feel accomplished, depending on the length, after reading a book. The last time I was in Barnes and Noble I actually went looking for the book I had read on kindle to see the actual number of pages! See, your situation is like mine. I’m similarly enamored with the Kindle – it is great for reading, it is easy to download stuff. But there is just lots of room for innovation with it, both in the device and in the service and “ecosystem” around the device. Like with travelers, you are in a special situation where it is understandably attractive. Thanks for the clear review. Personally, I only use my phone e-reading apps for classic books, and I don’t think that’d change if I bought an ereader, so I’m not likely to do so… but if I had the disposable income, it’d probably go to the nook or the ipad, partially just because I don’t like Amazon nor what it has done to the book business. I can’t believe people would pay more for an ebook than a paperback, but if they’re continuing to sell them that way, people must be buying, right? That’s insane. Glad to hear you’ll stick around! Personally, I think B&N has done more to hurt small indie stores than Amazon, and for that matter WalMart has done even more damage – it’s amazing how many people do their book buying at WalMart. B&N and Borders at least know something about what readers like. WalMart, not so much. I like the Kindle, but it is a flawed product in a number of key ways, mostly on the service side. I hate to say that, because generally I like shopping at Amazon – it’s made Christmas a lot easier for me!